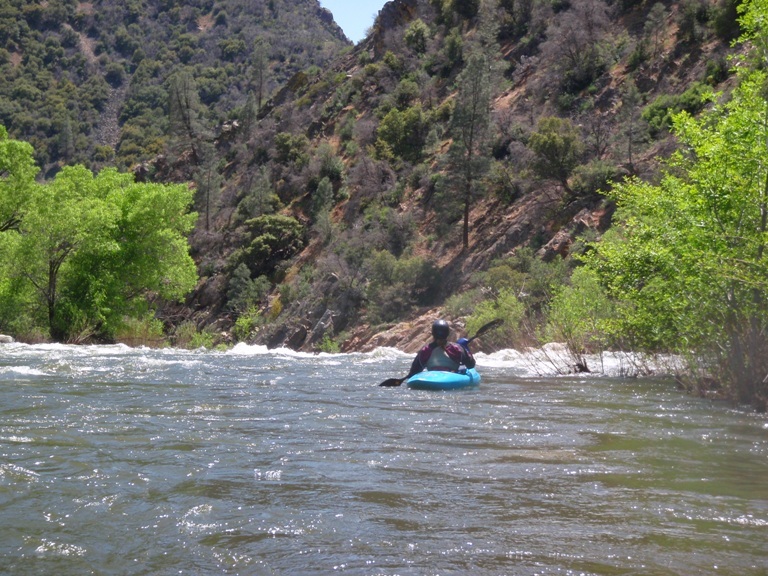 On my second trip to the Kern River, I wanted to make sure I got on the remaining stretches of the Upper Kern that I missed two years prior. With this in mind Diane and I upon reaching Kernville, drove straight to Johnsondale Bridge and the put-in for the Limestone run. Johnsondale is also the take-out for the Forks of the Kern, a class IV-V run which we would do two days later. Limestone is a short run with only a few significant drops in it. 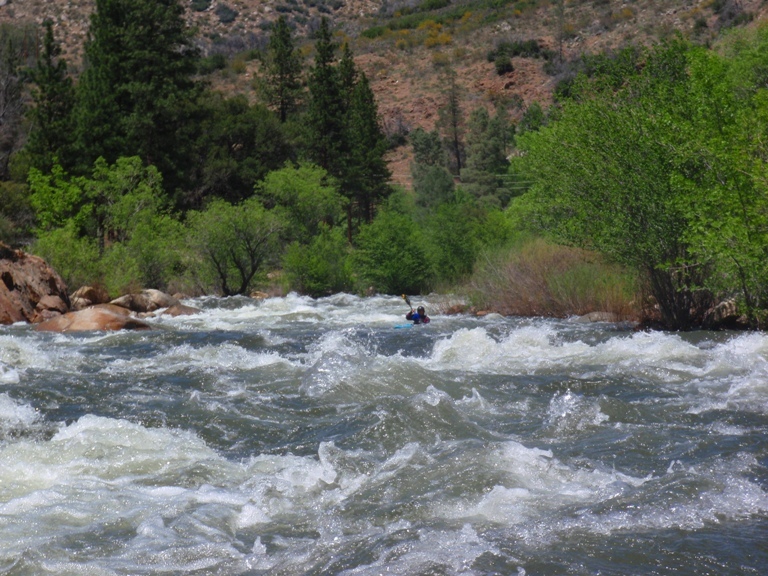 At 2,300 cfs the rapids were hard III+ or easy IV-. Each had holes that you would not want to enter but the moves to avoid them were easy. In all, we though the run was fun. The only draw back was the Memorial Day Weekend revelers drinking heavily all along the river. You can see the Forks of the Kern write-up for that rant. 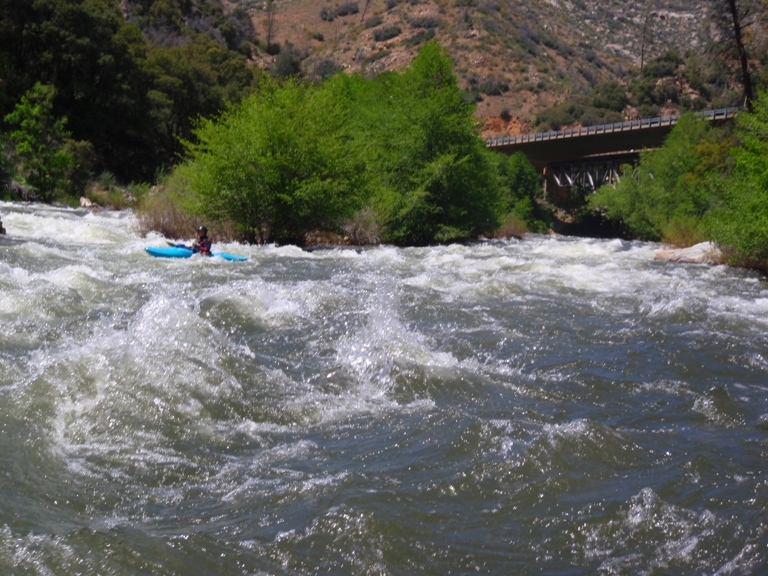 I just don’t know where a drunk on the side of the river gets off warning us about the 250 deaths since 1968 when in reality only 2% have been rafters or kayakers. The other 98% have been people floating on inner-tubes, intoxicated, without life jackets. It all just made of an abnormal river experience. Usually one of the things I love about being on a river is that the common person can’t just walk to the rapids and have a party. This isn’t the case with the Kern. I should also state again, it was only really bad because of it being Memorial Day weekend. Two years prior there was hardly anyone there at all as it was end of March or beginning of April. So anyways, if you aren’t intending to continue on to the Fairview run, make sure you catch the river access with the very obvious sign telling you to exit the river do to the approaching hazard. 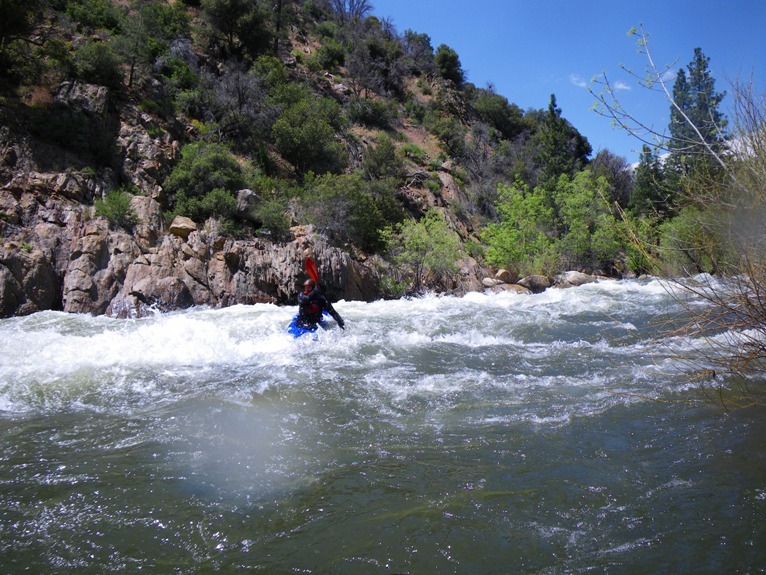 If you do plan on continuing you can take-out on river left 20-30 feet above the lip of the falls. You can then walk on the narrow road that lacks a shoulder about 100 feet to a culvert pipe that passes under the road. 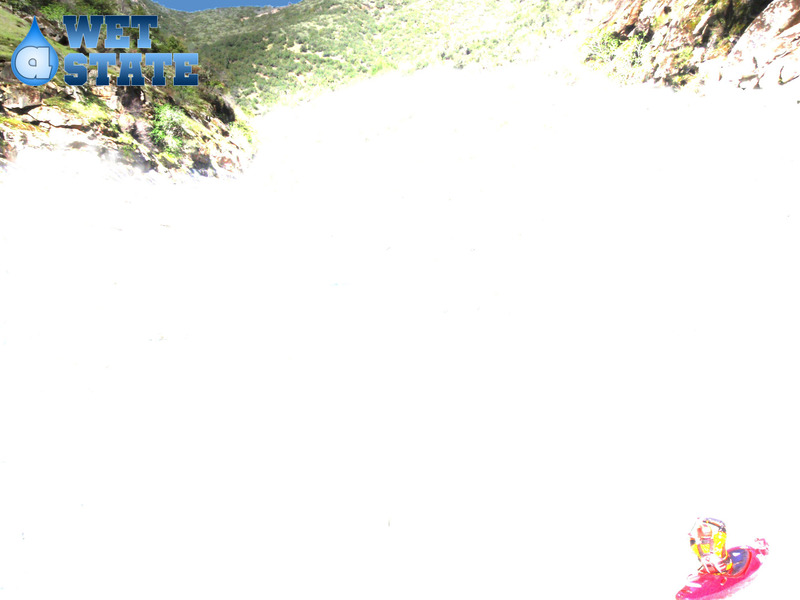 You can enter the culvert and run the Sidewinder rapid. Otherwise, walk the quarter mile on the very exposed road. Split (II+). The river splits around an island just downstream of put-in. We went left and it is clear. Brush Creek (II+ to III-). The river splits around another island. Both sides are ok. I went left and totally didn’t even notice Brush Creek entering. Limestone (III+ to -IV). 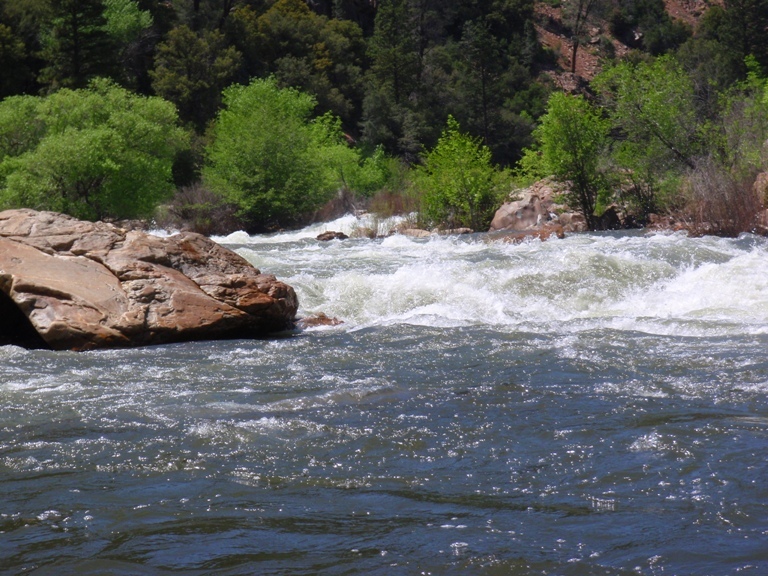 At 2,300 cfs this rapid was straight forward down the right side to enter and then cutting left. There was a wave hole that looked intimidating at the top but ends up being just fine. There were some holes on the bottom right to avoid. Joe’s Diner (III to -IV). The left side is the most clear. The right and center have some large holes that are less than ideal to venture into. 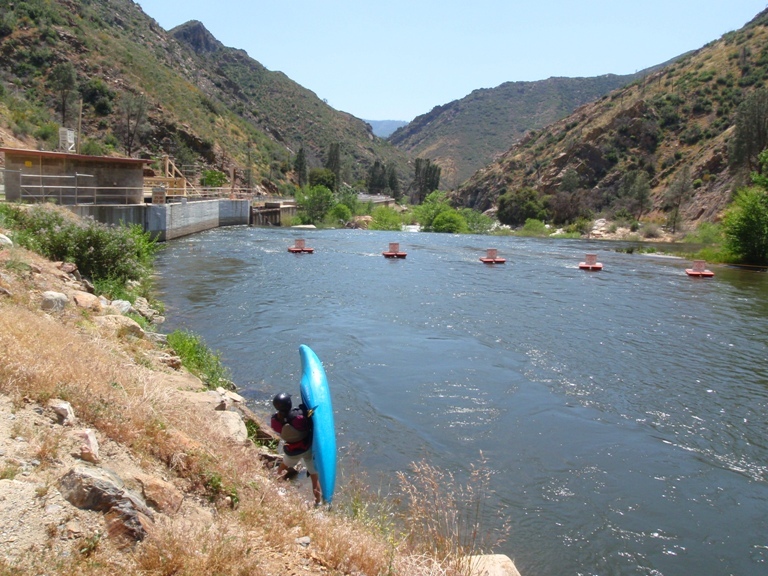 Take-out: Drive up Sierra Way from Kernville 15 minutes or so until you see Fairview Dam. It is impossible to miss on your left. Just after the dam you will come to a day-use area or campground. This is take-out if you are only planning on doing this stretch. 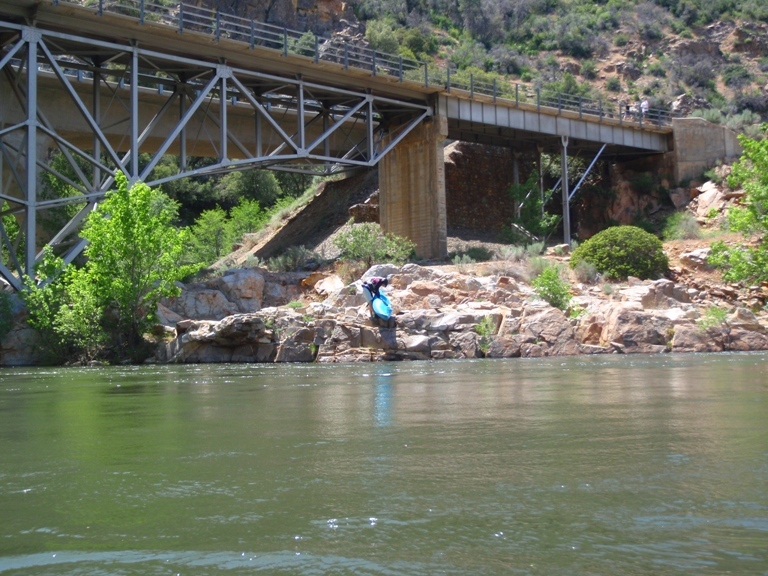 Put-in: Continue upriver the 2.4 miles to Johnsondale Bridge. Park in the parking area just past the bridge.